Available to Order. Estimated delivery is 02/05/2019. Whether you need that unparalleled sound at home, in the studio or for live performance, the Yamaha CLP-635 will not let you down. Yamaha has worked extremely hard to give you a digital piano that looks, sounds and feels as real as a grand piano thanks to new and improved modelling technology. The authentic sound of the CLP-635 is courtesy of the core samples that have been built in. The sound of the CLP-635 is more authentic than before thanks to samples from Yamaha's finest concert grand, the CFX, combined with the distinct, historic sound of the Bösendorfer Imperial concert grand. The CLP-635 has a custom-designed sound system to recreate string-resonance and the natural reverberation that occurs when strings react to one another. Damper resonance reproduces the broad, deep sound field of an acoustic piano and it also portrays the tonal changes that result when a damper pedal on a grand piano is depressed. With all these sonic qualities, you can barely tell that you are playing a digital piano. The responsive touch of the CLP-635 comes from the GH3X keybed with synthetic ivory keytops and 256 note polyphony. The material of each key is highly absorbent which prevents slipping even during a lengthy performance. The smooth release technology of the Clavinova keys give you the closest possible feel to an acoustic piano. The unmistakable tone of the piano is achieved as a result of Yamaha Virtual Resonance Modelling (VRM) technology to give the pianist a true-to-life acoustic experience. 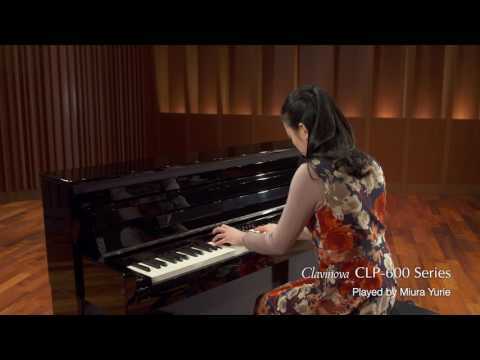 The Yamaha CLP-625 Clavinova Digital Piano comes loaded with a total of 19 high-quality voice demo songs, 50 piano songs, 303 lesson songs and 20 rhythms. This is an advantage of having a digital piano as it gives you a plethora of effects to experiment with. A digital piano allows you to tweak your volume should you need to, and this is a great feature to have on the CLP-635. You can lower your volume to practice quietly at home without causing a disturbance. This is further improved by two headphone sockets, so you can practice alone or with a friend or teacher simultaneously, all in total silence. Yamaha has integrated advanced binaural sampling for the first time in this Clavinova model, so after a little while you will forget that you are wearing headphones due to the sheer sound quality. Lowering the volume this does not mean that your sound will be compromised either. Thanks to the Intelligent Acoustic Control system, each chord and note will still be distributed beautifully. The Yamaha CLP-635 Clavinova Digital Piano comes in an elegant cabinet with all the features a pianist would love. Get that genuine grand piano sound and feel with the Yamaha CLP-635 Clavinova Digital Piano.